Before Azure and AWS, Microsoft development teams would need a server on their local network that would manage change control and commits. Once a week, a chosen developer would compile and deploy the application to a production server. Now developers have the option of creating cloud applications in Visual Studio and connecting their projects directly to an Azure cloud server. For a Windows developer, Azure was the choice I made to develop my own software projects and manage them in the cloud due to the easy integration between my development desktop and Azure cloud instances. Azure has similar services as other cloud providers, but it has some advantages for Microsoft developers that need to deploy applications for the enterprise. The biggest advantage for an enterprise is that it reduces the amount of on-site resources needed to support a developer team. For instance, the typical Microsoft -based enterprise has a team of developers, a staging server, a development server, QA resources, Jira, and some kind of ticketing system (just to name a few). With Azure, the team can set up these resources without the real estate or the hardware on-site. It also has integrated IaaS, so you can create a seamless bond between your internal network and the cloud infrastructure. In other words, your users will never know if they are working on a local server or running applications on Azure. 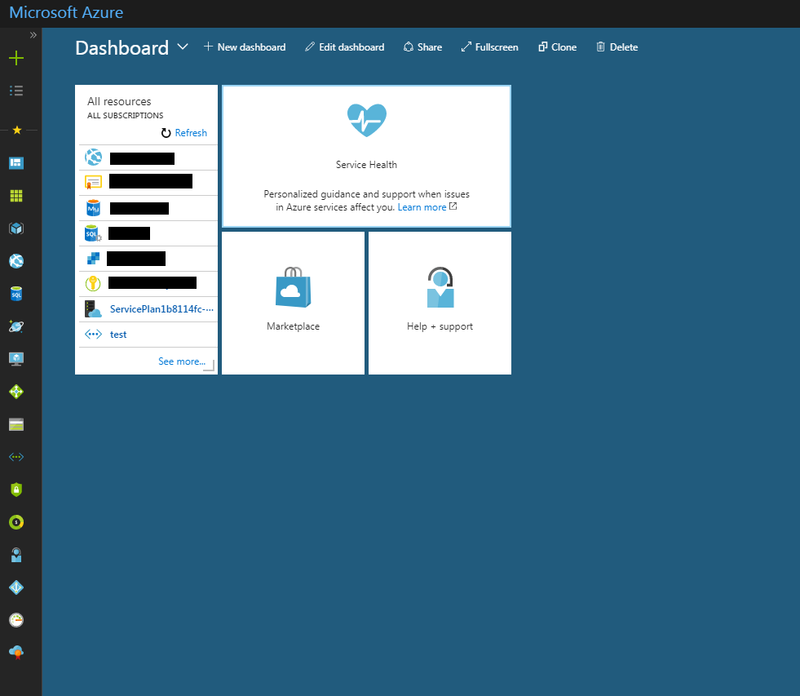 For anyone who has managed Windows servers, the dashboard (Azure calls it your portal) is intuitive. The difficult part of starting an Azure account is understanding all of the options you see in the dashboard. For developers used to local environments where you need to provision multiple resources for one application, it's important to understand that everything you need to build an application is at your fingertips. You no longer need to go out and purchase different services such as SSL and database software and install it. 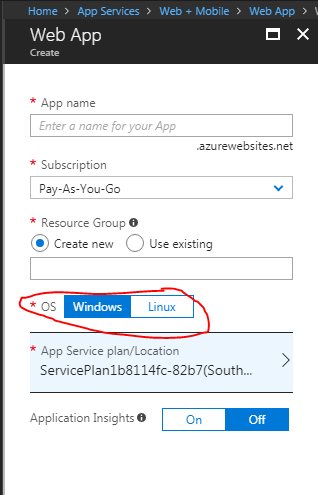 You just click the service that you want and click "Create" in the Azure portal and Microsoft builds it into your service agreement. If you pay as you go, then you only pay for the resources that you use. You can build APIs, services, start virtual servers, and even host WordPress sites from your portal. In the image above, I've blacked out the names of my resources for security reasons, but you can see that I have a web application, an SSL certificate, two databases (one MySQL and one MSSQL), email services and a vault (for the SSL cert) in Azure. I have an individual plan and don't use many resources from their servers, so I pay about $100 a month for a small WordPress site. When I had two web applications running, I paid about $150 a month. The main reason I use Azure is for it's easy integration with my Visual Studio projects. For Windows projects, integration between Visual Studio and Azure is as simple as creating a web application and copying the connection information into your projects. Once you've created the connection in Visual Studio, you can use Azure for change control and promote code directly from your development computer. 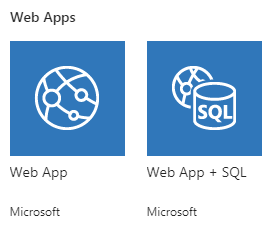 For a simple web application, Microsoft offers a web app and a web app with SQL. This should be self-explanatory. If you just want to build a web application and don't need a database, then you choose the first option. The second one will set up a web app and a SQL Server. You aren't limited to a Windows environment either. When you create a web app, Azure asks if you want to use Windows or Linux. When you create your application, it sits on a subdomain named <your_app_name>.azurewebsites.net. This will be important when you set up your TLD. This feature is the downside of using Azure over traditional hosting. When you set up your TLD, you set up a CNAME and configure a custom domain in your Azure settings. When search engines crawl your site, sometimes they index this subdomain instead of only the TLD. This makes it difficult to work with when you use applications such as WordPress. When you install WordPress, you install it on the subdomain, so WordPress has the subdomain in all of its settings. This causes errors when you promote the site to your TLD, and you must do a global database search and replace to remove the it from your settings. I found this was one con to using Azure for my websites. After you create the web app, you're shown basic information to get started should you just want to upload files to the new location using FTP. The "Get publish profile" provides you with a downloadable text file that you use to connect Visual Studio. You can also connect it directly to your own GitHub repository. As a matter of fact, Microsoft will generate pre-defined settings for several repositories. After you download one of these files, you import the settings directly into your profile and you're automatically connected. When I work in Visual Studio with an Azure connection, I check out files, edit them and check them back in as I code. It feels exactly like the old-school Team Foundation Server environment except I don't have to buy the expensive equipment and licenses to host an internal Microsoft Windows server. Occasionally, I get a customer that has an application that they want me to test. It's usually in beta or it's their recent stable release but it's something that I wouldn't normally use on my machine. It's dangerous for me to install third-party software on my work machine. Should my customers' software crash my computer, I lose important data. Not only could I lose data, but I don't know what type of software I'm installing on my important developer machine connected to my home network. I don't want anything to have the ability to search my home network and storage. With an Azure VM, I not only keep the software off of my local machine, but it's shielded from my local network too. I could install a VM on my local desktop, but I like to keep this machine clean from anything other than what I need to develop and code. I use Azure VMs to install the software, and then I can destroy the VM when I'm done with it. 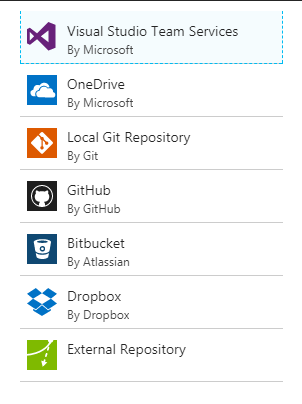 What's great about Azure is that they have several pre-installed operating systems and frameworks to choose from. When I'm working with client software, I use the default Windows Server installation, which is 2016. Microsoft adds the latest operating system to its list as they are released. It's an Azure advantage over working with traditional VPS service. With traditional service, you must ask the host to upgrade your operating system and change your service. 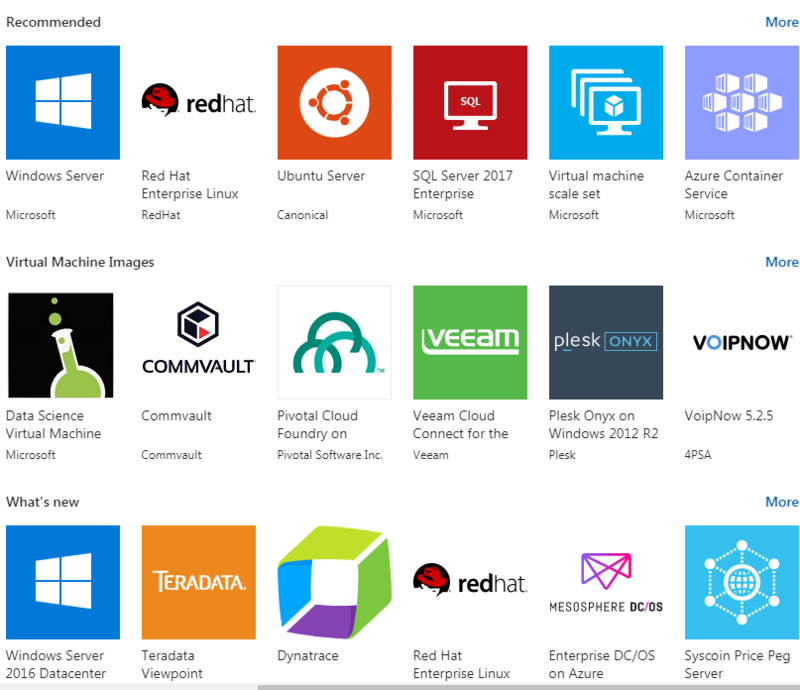 With Azure, you spin up a new VM with any operating system you choose. I then use the VM to install the software, work with it until I'm finished a project, and then destroy the VM when I'm done. Because I only use the VM for a short time and don't connect it to any resource-intensive applications, it only costs me a few extra dollars a month. But I keep third-party apps "sandboxed" from my own network without using local resources. Occasionally organizations have a separate WordPress site for content even with a team of Windows developers. It's easier for marketing to publish content with WordPress. Instead of using a separate shared host, Azure has the option to create an app with WordPress pre-installed. Most people think running WordPress on a Windows server is senseless, but you get some kind of security from standard hacks that look for .htaccess or Apache vulnerabilities, and you can keep your web services all in one place. It only costs a few dollars to host the WordPress site, but you pay for traffic that hits the service so it might be much more if you have a high-traffic blog. Azure has its Insights services as well, so you can monitor WordPress unlike traditional shared or VPS services where you need a third-party application. You also get monitoring and all the available infrastructure such as load balancing, SSL, and monitoring should you need it with the WordPress site. These aren't available with simple shared or VPS hosting. While running WordPress on Windows seems counterintuitive, running it in Azure is more beneficial for the enterprise that needs to keep detailed statistics on site usage and security from script kiddies that attack any public WordPress site with poor Linux management. Is Azure Better than AWS? Most people will tell you that AWS is a better choice, but I preferred Azure's portal. I found spinning up services was more intuitive, but what sold me was the integration into Visual Studio. If you're in an enterprise, the one advantage of Azure is that you can integrate Active Directory Services so that your network expands into Azure's cloud IaaS. This would be much better than building a separate portal that you must control with individual security settings. This eliminates the possibility of accidentally exposing data from incorrect security settings. If you decide to try Azure, they give you the first 30 days free. AWS gives you 12 months, so users have longer to figure out settings. I found Azure beneficial and kept paying for a low-traffic, low-resource account until I could figure out if I wanted to permanently use it. I've had an account for two years now and don't plan to ever switch.